Crusaders manager Stephen Baxter is relishing taking on a "brilliant" Ballymena side in the Irish Cup quarter-final at Seaview on Saturday. "If you can't get up for a Ballymena match then you shouldn't be playing the game," he said. "They've been brilliant this year and it will be a ding-dong game." Warrenpoint Town host Larne Tech OB and Dungannon Swifts play Ballinamallard United in Irish Cup ties while Glenavon host Cliftonville in the Premiership. 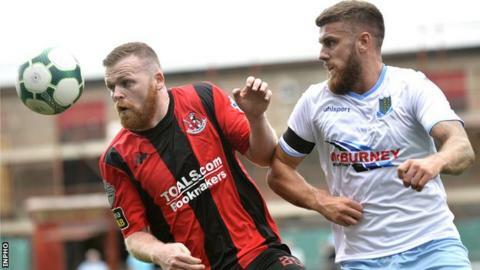 The last-eight encounter in north Belfast tops the bill as Ballymena, second in the league, travel to Crusaders, who sit five points back in third. Ballymena are aiming for a first Irish Cup success in 30 years while Crusaders last lifted the premier piece of knockout silverware in the local game in 2009. "It's going to be mightily tough going to the home of the league champions - they are a very accomplished team," said Sky Blues' boss David Jeffrey. "I've been listening with interest to interviews with some of their players and without a doubt they are targeting the Irish Cup. "We'll go there and see it as another challenge, give it our best and see where that takes us, but we know how tough Saturday is going to be." It has been a fairytale Irish Cup run for Amateur League minnows Larne Tech OB and this could be the perfect time to face a struggling Warrenpoint Town side. "We're going into an Irish Cup quarter-final stretched to the max in terms of injuries and suspensions," said Town boss Stephen McDonnell. "We've lost four on the trot and they way we're conceding goals we could concede against anybody. "It's a massive concern going into Saturday so it's up to the players to pick themselves up and get a result." It is Premiership versus Championship at Stangmore Park as Dungannon Swifts go up against the Mallards while the opening quarter-final between Larne and holders Coleraine takes place on Friday night. Saturday's sole Premiership game sees fourth-placed Glenavon entertaining a Reds side sitting six points back and coming off a 2-1 defeat at Ballymena on Tuesday night. "When they are on their game Glenavon are as good as anyone in this league," said Cliftonville manager Paddy McLaughlin. "I know they lost one or two players in January but they've got a strong squad full of quality and it's going to be another tough game." There will be live coverage of Saturday's four games on BBC Radio Ulster and the BBC Sport website from 14:00 GMT (Kick-offs 15:00).